Ready for some more futuristic 3v3 multiplayer ball flinging? We have another 2,000 Steel Circus Steam Alpha keys to give away! As we mentioned during last months giveaway, Steel Circus pits players against each other in fast paced 3v3 multiplayer arena matches that play like a futuristic version of handball. It takes place in 2035, with various factions competing in the Steel Circus Championships – not just an important sporting event, but an integral part of helping the various factions of the galaxy maintain their fragile alliance. There are seven different factions and around 20 unique playable champions planned for the game. 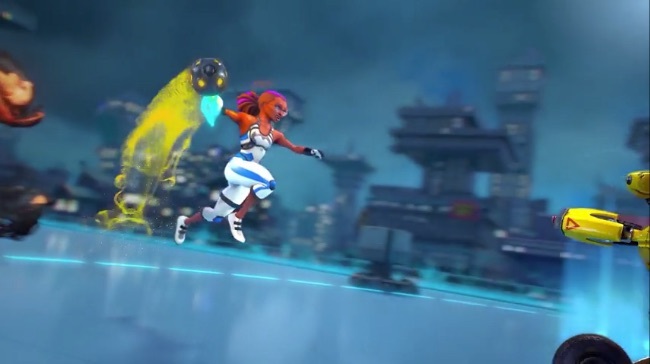 Each champion has their own unique skills that make them suited to playing in different positions in the arena – such as Cap-x02, a goalkeeping robot who can summon forcefield walls to deflect the ball. The next Steel Circus Alpha test will be live from Thursday 9 am GMT on the 4th of April through to 1 pm GMT on Sunday the 7th of April. To claim your key just carry out any three actions in the giveaway widget below and your key will appear instantly. Please note that if you already have a key from a previous giveaway then you don’t need a new one to access the next Alpha test. Steel Circus Alpha Key Giveaway! !